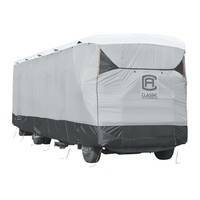 Get a Class A RV cover that's designed to protect your motorhome from the elements. We stock Classic Accessories and ADCO covers, in the best water-repellent and breathable fabrics, Tyvek Wind, SFS Aquashed, and PermaPRO. Whether you have own a Coach or a Tiffin, a Fleetwood or a Forest River, our motorhome covers are guaranteed to fit. 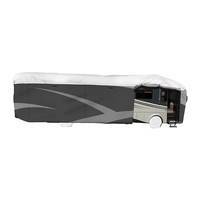 Get the correct size cover for your Class A motorhome. Measure the overall length of your RV including everything you want covered. Going by RV manufacturers specs can often result in choosing an item which is not long enough, as the manufacturers do not always include bumpers, etc. *Note: Class A units equipped with large fold-out mirrors should be folded in for best fit. We also offer Windshield covers and Tyre Gards for your Class A.
ADCO Products, Inc., located in Valencia, CA, has over 55 years of expertise in manufacturing RV protective products. As a family-owned business, ADCO takes a personal interest in the quality and durability of every product they produce. Most Class A owners enjoy simply looking at their RVs. Enjoy the next best thing with an ADCO Designer cover, which features an exterior design like the paint schemes of many RVs on the road today. High Performance Polypropylene material that beads water on contact. Two-tone Designer Series for sleek and stylish appearance. Cinching system for the best fit. High Performance Polypropylene sides with Dupont Tyvek roof. Increased protection for roof where it is needed most. Take a look at our accessories to find items to further protect your RV. Classic Accessories has been in business since 1983 offering superior protection for your RV. The 100% woven polyester offers maximum protection for what matters to you. 100% Woven polyester for protection against UV rays, rain, dirt and dust while remaining breathable. Extra strength and light weight. Elasticized hem corners for a snug fit. 100% Woven polyester sides with Dupont Tyvek roof. Highly water repellent and UV resistant. We guarantee not only the quality, but the fit of our products. If you are not satisfied with either of these, you are able to return the cover for credit or exchange it for another. If you are not satisfied with the quality or fit of any of our products, we will refund the purchase price of the product. Please see warranty information for complete details. 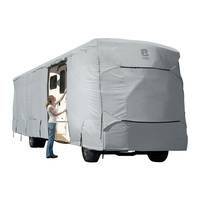 Why Buy from RV Covers Direct?